NOTE: NMTSO is again operating in a limited manner after a catastrophic single-point of failure to our ageing system at 0635 MST Jan 14, 2014. A new data center was brought on-line May 1, but the forced relocation of our station repeater from M-Mountain in January entail that 4 of our stations are not being received, impacting detection and location capability. This page will be updated when repairs are effected. The Socorro region is a natural geophysical/volcanological laboratory in that it accommodates an inflating mid-crustal magma body which perturbs the local stress field and causes numerous small earthquake swarms. The upper surface of the laterally extensive Socorro Magma Body is nearly flat and is approximately 19 km deep. Seismicity in the area and greater New Mexico is monitored by the New Mexico Tech Seismological Observatory (NMTSO) in collaboration with the U.S. Geological Survey. 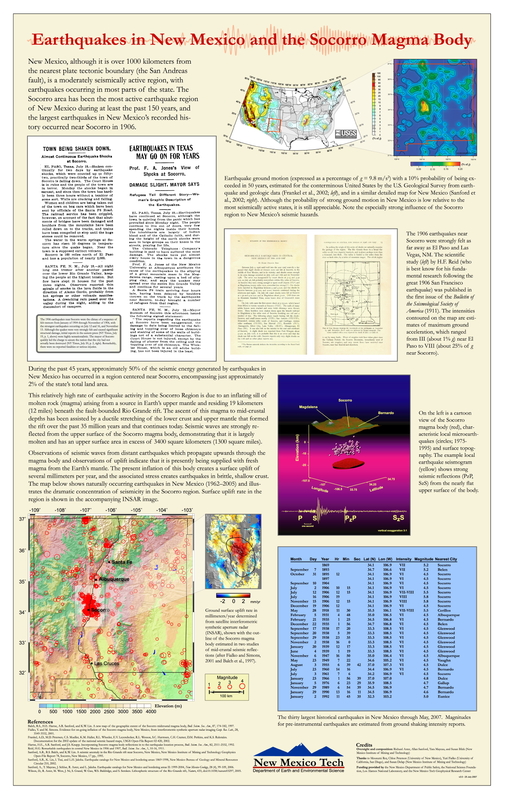 Historic seismicity (through 2005) and seismic stations operated and maintained by the Geophysics Program of the Department of Earth & Environmental Science at New Mexico Tech. ANMO is a Global Seismographic Network station operated by the USGS Albuquerque Seismological Laboratory. The Geophysics Program operates a network of seismic stations (black circles on the map above). Data are telemetered to the New Mexico Tech Seismological Observatory located in Workman Center on the NMT campus. Data are digitized at 100 samples per second, and the triggered time series are stored for analysis, as well as forwarded to the IRIS Data Management Center and the U.S. Geological Survey National Earthquake Information Center. The Socorro Seismic Anomaly is illuminated by the large number of earthquakes near Socorro; it historically accounts for 45% of New Mexico seismicity, yet occupies only about 2% of the area of the state. The NMT Seismic Network is supported by funds from Westinghouse Corporation and Geophysics Program resources.